While choosing the man’s wedding ring is often not as celebrated as choosing the woman’s, it is still an important part of the marriage. The man’s wedding band is usually selected by the woman and is her chance to show her love and affection for him. The band she chooses represents her never-ending love and commitment to him. With a little planning and research, it is easy to find the perfect wedding ring to express those things! 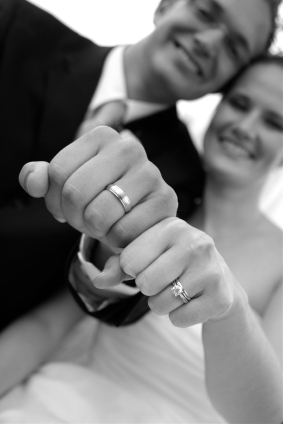 Like wedding rings for women, prices range from low to high for men’s wedding bands. A few things affect the price of a wedding ring, including type of metal, type of gemstones in the ring, and the number and size of gemstones used. Basic wedding bands with no diamonds or other stones can start at prices under $100.00, depending on the retailer chosen. As stated before, the type of metal chosen does affect the cost. For example, tungsten and titanium bands cost more than a simple gold band. Tungsten is durable and does not scratch, which is why it costs more. Prices also start to climb when diamonds are added. This is becoming a more popular trend for men’s rings and can add hundreds of dollars to the cost of the ring. Rings with diamonds can be priced well over $2,000. Ultimately, the price range is determined by personal finances. It is easy to find an affordable, attractive ring if the buyer does some price comparisons. The person buying the ring should visit several jewelry stores and find out about financing options. Many of the larger retailers carry rings that look very similar at different prices. Do some research to get the best deal! While the selection of male wedding rings is generally smaller than the female selection, it is not impossible to find the perfect ring. An excellent place to start is Kay Jewelers. They offer a beautiful selection of rings at various prices. There are simple gold bands as well as more elaborate rings that contain diamonds and etching. Another retailer to check is Zales. They offer a wide selection of wedding rings and fashion rings for men. Often a ring that is chosen will classify as a fashion ring but can be used as a wedding ring. Zales offers rings starting at prices under $100. One can also shop online for wedding bands. Amazon’s website has a large selection of wedding rings for men. This is an option for those looking to save money. Beware of which seller is chosen. Try to find out as much as possible about the product and the seller before buying online! For those looking for something special and budgeting is not an issue, check out the Scott Kay selection. This retailer offers wedding bands with a more unique and masculine look. Rings that are made out of gold are easy to re-size if they do not fit. Most display rings are either a size ten or eleven because these are the two most common sizes for men. If the wedding band is bought by the woman, she should find out what size she needs before going shopping because some metals cannot be re-sized. If the store does not have the ring in the right size it will have to be ordered, which can take up to two weeks. For example, tungsten is a popular metal used for male wedding bands. Because it is such a strong metal, it cannot be re-sized. It must be ordered in the correct size. One down-side of buying a ring made of tungsten is not having the option to have it re-sized if the person’s ring size changes. A benefit of using tungsten is having a ring that cannot be scratched or damaged in any way. Most retailers offer a care plan for the rings purchased in their stores. These usually cover any work done on the ring, including re-sizing. This is an essential thing to buy because a care plan will cover lost gemstones as well. The only thing the consumer is required to do is have the ring checked every six months. The most effective way to find the best prices is to shop around. Try shopping locally as well as major retailers. Pay attention to sales. Many jewelry stores have semi-annual sales after Christmas and in the summer. These are both good times to purchase a ring at a discounted rate. It is also important to be an informed buyer. If there is a particular ring that is wanted, check to see if more than one store carries it. Don’t be afraid to let the salesperson know that you have been shopping at other stores to find the best price. Often the possibility of losing the customer to another competitor is enough to match or beat the original quoted price. If shopping online is not a problem, try Amazon and eBay. Both websites offer wedding bands for men. Of course, there is a risk when shopping online, but there is also the benefit of paying lower price. Overstock.com is also another website that offers wedding bands at low prices. The down-side to buying online is the inability to buy a care plan for the ring. Buying online is not for everyone but does have its benefits. As stated before, it’s important to buy a ring that is realistically affordable. Some retailers, such as Kay Jewelers, require a down payment. It is wise to be able to make a down payment, but if it is not possible many stores offer a credit line. Often if the price of the ring is over $500, interest is not applied for six months or more. If a credit card is used, be sure to find out the requirements. A down payment is not always required, but it is usually a certain percentage of the cost of the ring. As with any credit card, the faster it can be paid off the better! Overall, it is important to have a budget and stick with it. It may be easy to spend the money but just remember that the payments will have to be made eventually, so make sure they are affordable. After all, it’s not the price tag on the ring that matters most. What matters most is the love the ring symbolizes. iam searching for 2 male wedding rings for me and my man i want something nice and that you can wear in public too!! can you help???? robert in richmond va.
iam seeking 2 male wedding rings!! for me and my lover!! that you can wear in public and at home!! but i want it to be a odd ring!! can you help me? ?